The best master closet layouts incorporate a mixture of shelving, rods, racks, and cabinetry options, each designed for a different storage need. 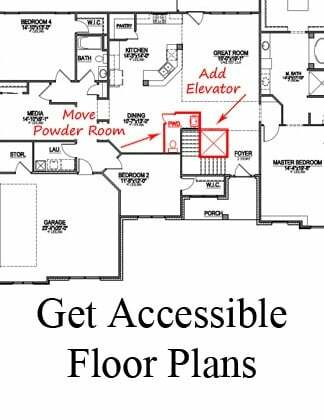 Here are 6 master closet design and layout ideas you'll want to see photos of. Cabinetry islands are making their way into more new homes. Island cabinets act as a drawer storage center, staging area for laundry, and folding table - maximizing the utility of your master bedroom closet. If you want to keep your master bedroom more open, consider adding an island cabinet to the closet in lieu of a second dresser or chest. Built-in cabinets are a great way to create hidden storage - especially when paired with open shelving and wrap-around rods. 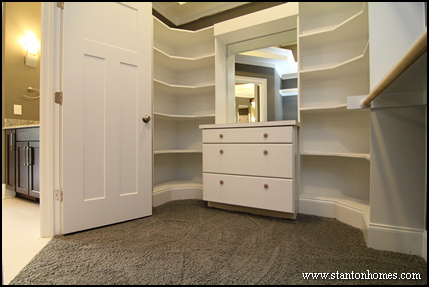 In this first photo, the master closet shelves were customized to accommodate a center cabinet with mirror above. 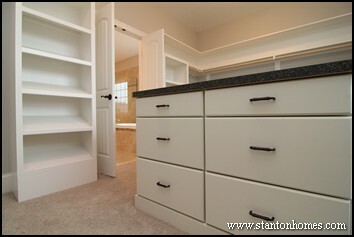 In this second photo, a dual-drawer cabinet was added with a mirror and open shelving above. 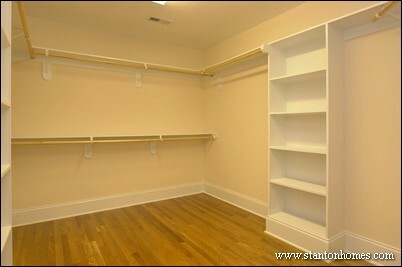 This photo shows the "his" closet - there is an identical "her" closet located directly opposite. 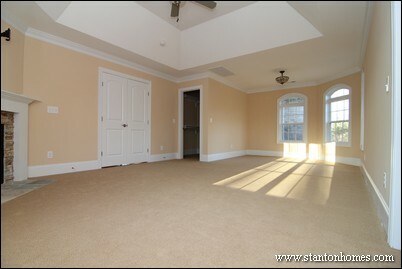 In this home, hardwood flooring was carried into the master closets. 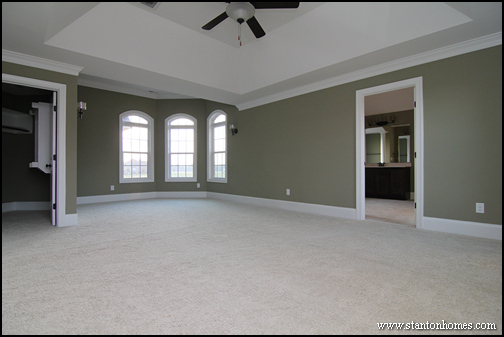 While home owners generally choose to include carpet in the master bedroom and closet, some prefer the feel of walking on hardwood floors. 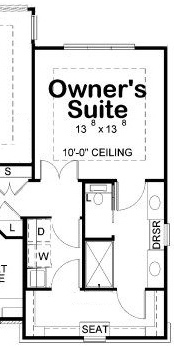 In this custom home master bedroom layout, the (smaller) "his" closet is included in the master suite and the (expansive) "her" closet is located on the other side of the bathroom. 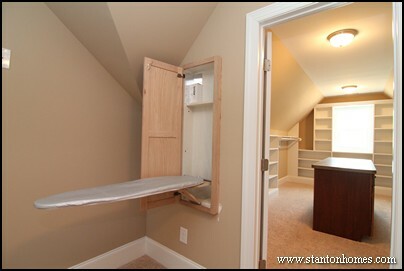 This his and her walk in master closet design is perfect for maintaining personal space. 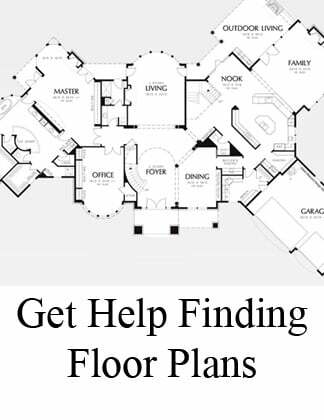 See a floor plan of this version of the Summerlyn here. In this floor plan, you'll also find a second story laundry room just outside these master bedroom French doors. In this custom home design, the master closet connects the laundry room to the master bathroom. Because the bathroom layout is relatively compact, the master bathroom laundry room combo design adds invaluable ease of access to two of the most used rooms in the home. 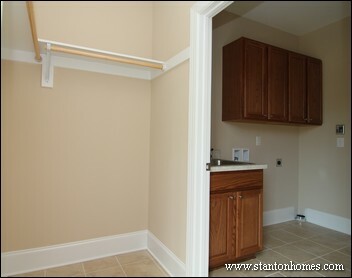 This master closet features tile flooring - designed for wet use. 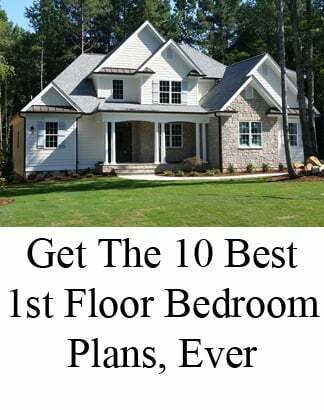 In many new homes, the master bedroom is on the second floor and the laundry room is on the first floor, making laundry chores tedious at times. 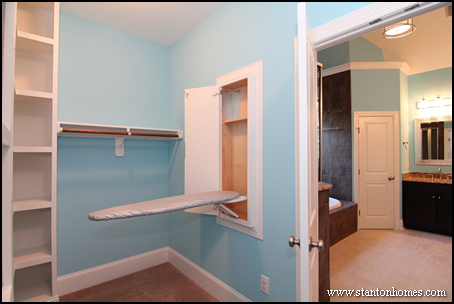 While it can be tempting to install a laundry chute (if the layout allows), adding an ironing board to the master closet wall can also make a big difference in your morning routine. Below are two examples of Raleigh new homes that incorporated an ironing board in the master closet - a trend we're seeing more of in 2014 homes. Each ironing board easily folds into a wall cabinet for long-term storage. An upper shelf is included for iron storage. Sometimes, the best closet design is the simplest - when you have a large closet space to work with, do not feel like you must fill it with a cabinet or walls of shelving. 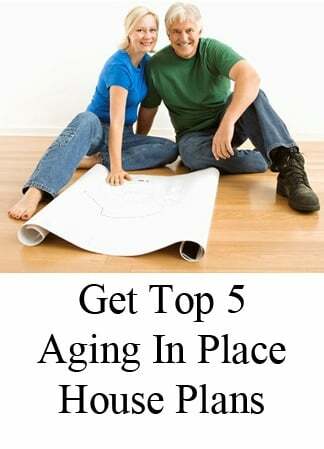 In fact, you may regret over filling your closet. 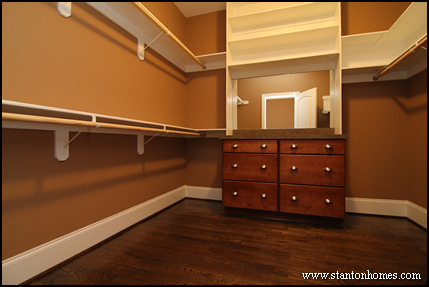 When designing your closet space, think of what types of storage you want most: rods, open shelving, drawers, racks, or counter tops. In this photo, rods were given enough space to allow dresses and suits to hang freely. There is also ample floor space to set a row of laundry baskets - so you can keep them out of the master bedroom and bathroom.